At the beginning of the picture, Ridley Scott and Nicky Allder were talking about having fire and CO2 etc coming from the engines, but then it came to the point where they were filming the landing leg chamber, referred to at the Claw Room by Ridley and the leg locker by Allder. 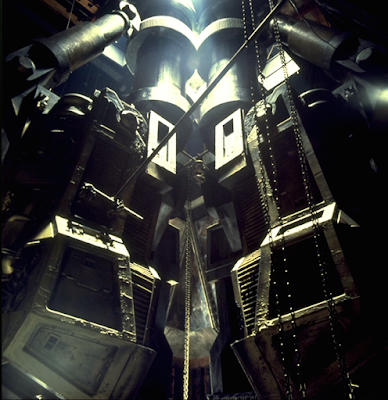 When they were shooting the scene where Brett "gets it" in the chamber, Ridley was looking for a strange visual touch to enhance the atmosphere which also would lead to the idea of the engines for the Narcissus at the end of the movie). They started out putting steam and smoke and various other things in the engine area and it wasn't quite right. So for no other reason that just to see what it would look like, Allder decided to try drops of water and Ridley responded "Yes, that's exactly what I want. " So they had this gentle dripping coming down and during one of the shots Ridley seemed to pan the camera up into the roof and what would be seen were all these water droplets falling, very heavily back-lit and Allder found the effect to be very beautiful, but there was a big argument about the water drops in the room but Ridley stuck to his guns. The studio people were asking "how would you have water dripping inside this room?" Ridley's response was "why not?" They asked "Why the chains?" 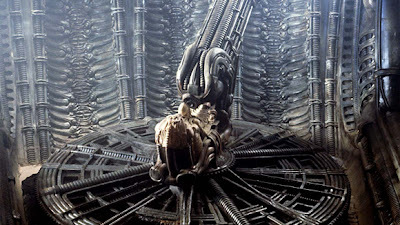 Ridley responded "Well, the chains aren't very high-tech. yeah, you know what, you've still got to let things down, so it's still going to be rope or water, it's not necessarily electronic"
He had the chains dressed because the room looked a bit blank and he needed the movement in there. Then they were asking " How's it moving?" He responded "I don't care"
The next question was "Why the condensation?" Again Ridley must answer a question, "Because something's gone wrong in the ship's air conditioning and it's not life threatening, they'll put up with it"
Even Ivor Powell, near enough sci-fi grounded found himself asking Ridley "what-what-what's all this wet business, I mean, wha-what-what's the raison d'etre for it"
And Ridley would respond " Oh no, it's great, you know." This room was the landing leg room where the floor would open and the leg would go down and support the ship. To get this reaction out of the cat, so next to Harry Dean Stanton, he had a German shepherd hidden behind a sheet of board on a leash, so obviously it couldn't get near the cat. They raised the board and Ridley got the reaction he wanted. As if the cat went "What!" It gets to the point where there's the sound of water landing on the peak of Brett's had and down his face, he's cooling off, and there's a long stretch that leads up to something. The forty foot tall, left over from an earlier filmed landing seqence, has been hoisted a few feet off the stage and the chamber has been constructed around it. To heighten its visual eeriness, criss-crossed shafts of light streamed through the overhead latticework and the water condensation trickled incessantly to the floor. The landing leg itself becomes the idol that almost filled up the room but remained suspended in the air. 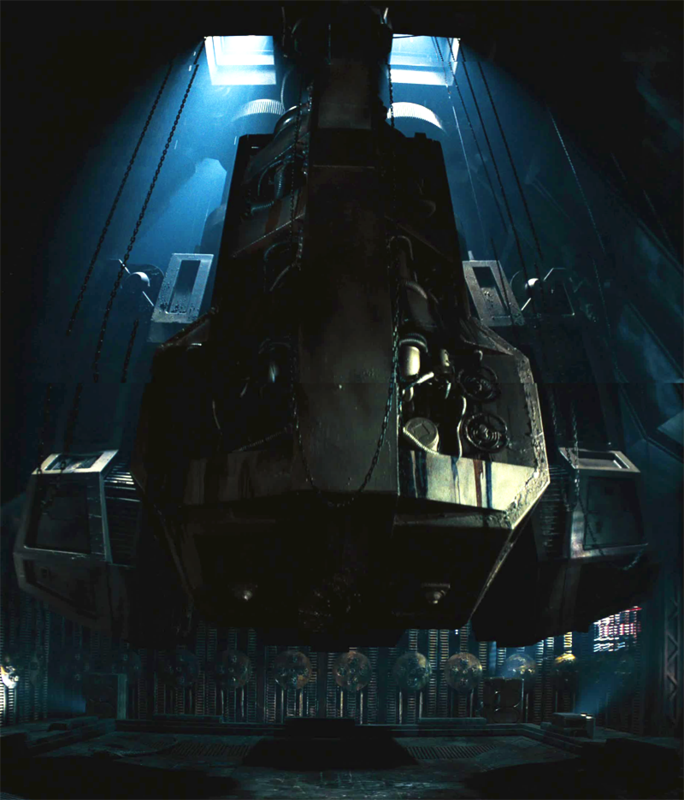 Ridley wanted to see the landing leg, the "claw" idol seen through the gap between the massive doors as big as the walls. The "claw" would be so big that it almost touched the walls but was still hanging in the air. 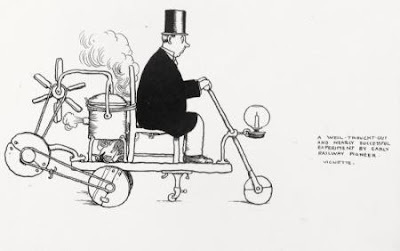 He also mentioned Heath Robinson in his comparison, an artist who drew cartoons featuring unlikely machines, and so his name entered the language as a description of any unnecessarily complex and implausible contraption. 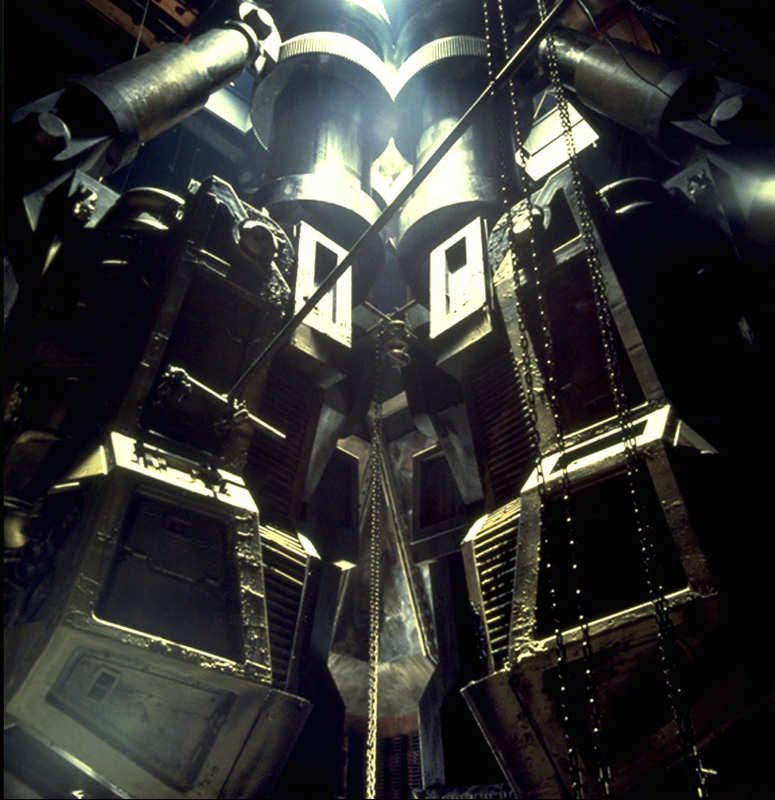 As it happens, the derelict space craft is also a temple in this way, with the space jockey as a central idol (which becomes interesting in view that the Space Jockey chair and occupant are inspired by the Henu Barque which would have taken central place in its own chapel) and becomes connected to the claw room temple by a piece of music played in both environments. 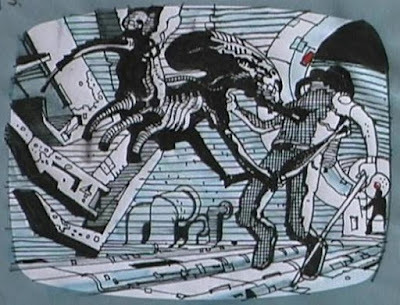 They were quite limited in what they could do with the alien. At one point, the script called for it to run up and down the corridors like a human being: but when they got the finished costume, they stayed late one evening at the end of a day's shooting - just to see what it looked like in the sets and to shoot a few tests. And of course, they found it would look ridiculous to see this thing running around - it would give the whole thing away immediately. So when they came to film that actual death of Brett, Ridley brought Nicky Allder onto the stage and said to him " I want Brett to get it now, but I don't just want the creature to dart out and menace him to start with. I'd rather have it reach out and sort of caress his head - almost kind of inquisitive at first. Then you see it squeeze up, and the blood starts running down Brett's face, and it cracks his head open." So they ended up doing this virtually on the spur of the moment. They ran blood tubes into Harry Dean Stanton's cap and through his hair, and the blood ran out and down his face. The cat is peering around the corner and going backwards, and then suddenly the alien is descending. 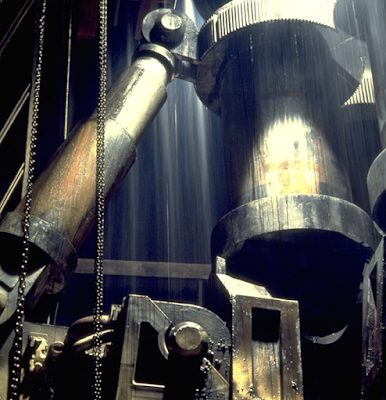 The thing now is in its mature form, transformed beyond recognition to a large seven foot engine of destruction. 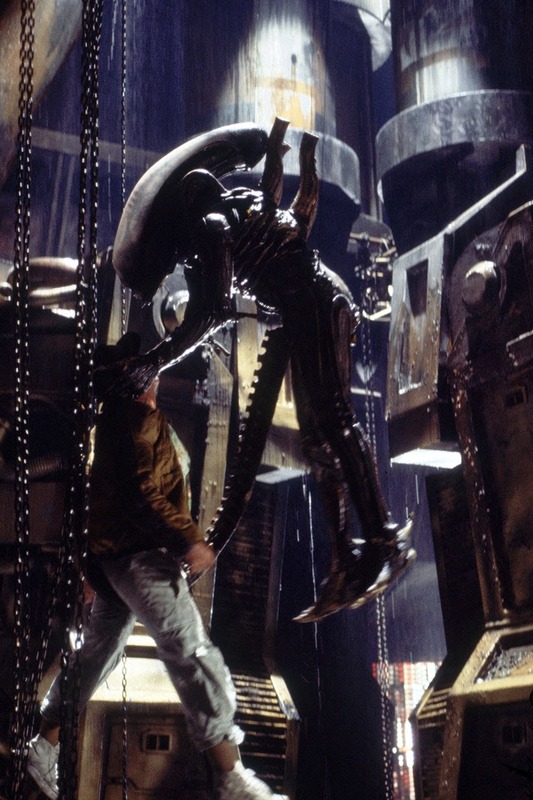 Ridley wanted the creature to be be perched on one of the ship's retractable landing legs. To maintain the gravity defiant position, Bolaji was suspended on a wire right. Ridley brought the creature in upside down and what it was at first was a tale coming down behind his back and then a jellified almost aspic like forehead, Brett turns around. The alien's head was seen as something beautiful in a streamlined way, and Brett doesn't know what he is looking at, and suddenly it comes up, its face is seen, the famous mouth opens up, the viewers would know that Brett was in real trouble and death occurs. Harry Dean Stanton felt that he screwed up with this scene because he could never play terror. He knew how to laugh, how to cry and do everything else but playing terror. It would happen later that he would understand that rather than look scared, he should just look as if he had not seen anything like whatever it was before. Parker and Ripley would have rushed in but somehow it seemed too normal and Ridley decides to leave Brett to die in a lonely fashion and then they would come to the discussion in the room. The cat would have been the only witness. Originally the scene where Brett was killed was longer and there was the rain in the falling water. and because the stuntman had his arms outstretchced, it looked as if the creature was on a cross hanging up but couldn't be seen properly because he was diffused by the falling water. They were saying to Terry, "take it out because you're giving it away"
But Terry responded "No one's going to know what they're looking at 'cause you've never seen it , "
When Sigourney saw the death of Brett, she thought that the scene showed the creature as something more than a destructive force. What she liked about the scene was how the alien comes down with these beautiful gestures and looks at him, puts out its hands and holds his face. Brett suddenly gets afraid and then alien strikes. (1:01:27 /1:04:06) Ridley Scott:There was this kind of stunned silence and er, and I remember Harry coming up to me, I think it was in the Egyptian, and he's so sweet, and Harry looked at me and said "Thanks for the closeups man"
(1:01:41 /1:04:20) Ridley Scott : Yeh, and er, and he meant when he walks through and goes "here kitty kitty kitty"
(1:01:48 /1:04:27) Ridley Scott :which is great. (1:01:52 /1:04:31) Ridley Scott: but but er, he was very sweet and er, he and Yaphet made this great duo, you know. (1:02:04 /1:04:48) Harry Dean Stanton: Now this is where I screwed up, I could ne... I could never play terror. Oh, I can play crying, I can laugh, I can cry, I can do everything but playing terror, and I didn't know it at the time but I found out later how to play terror. (1:05:00) And I didn't use it in this part. It worked, but I wish I had known it, you don't look scared, you just look like "I've never seen anything like this before"
(1:02:28 /1:05:12) Tom Skerrit: like... "woo-oo-ooh"
(1:02:57 /1:05:46) Ridley Scott: Again, sticking to your guns. Why the water? (01:03:00)So I just say," why not?" Why the chains? "Well, the chains aren't very high-tech". So I had the chains dressed because the room looked a bit blank and I need the movement in there uh. How's it moving? I said, "I don't care." Where's the water coming from? I said "condensation". Why the condensation? "erm because er, something's gone wrong and the ship, but they can... it's not, it's not life threatening, they'll put up with it." (1:03:39 / 1:06:26) Tom Skerrit: Oh, yeah. Oh Ridley! Ridley! Ridley! (1:03:53 /1:06:40) Harry Dean Stanton: That was my idea, Ridley loved me for that one, he took .... he lapped it up immediately. (1:04:22 /1:06:53) Ridley Scott: There's always this sense that "Had I made it too slow?" But I think the slowness. It isn't slow, I think it makes it more tense, (1:07:00) you know something always is going to happen. This was always amusing, I couldn't get a reaction from the cat, so I said I'll know what I'll do, so I put a board along side Harry Dean Stanton and had a German Shepherd there and we just lifted the board, it was on a leash so it never harmed the cat, but that's how you get that reaction from the cat, it's basically going "Whaaaat!" and erm, it... there. And that's where it sees the shepherd (01:05:00) and Harry's trying to ignore it. That's still a pretty unique look at a new movie beast. I think it was very confusing when people saw that. I mean, diffused and horrified and I think particularly after what happened on the table, I , think that it got to a moment where some people wanted to leave. And there were. We have people walk out at certain points. Which I was really nervous about and I was told afterwards "no no no, actually, in this instance , that's a plus. 'cause that will drive the word of mouth". And so I started to realise that word of mouth is as important as anything else on a film. Wayne Imms: It might be a silly question, but how do you know, how do you know how to make a film like that? Other voice (possibly Wayne or Ivor): What, other than Kane? Questar:The you attribute the alien with a sort of intelligence?